The Potato is one of the most important staple foods in the world, functioning both as a vegetable and as a starch. It is served for breakfast, lunch and dinner more often than any other food. Potatoes provide a good source of essential vitamins, minerals and dietary fiber. Potatoes are classified according to their starch content, which also determines the way in which they are cooked and consumed. 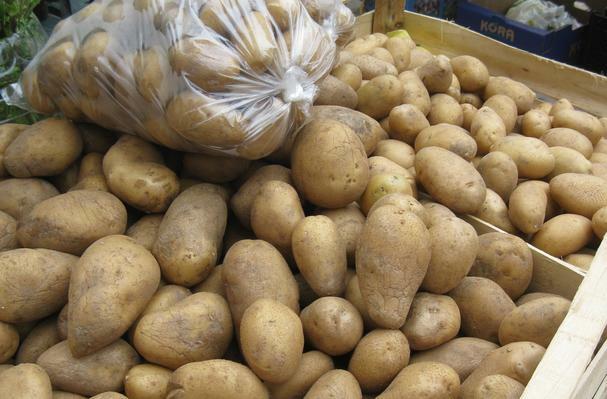 Waxy or New Potatoes are high in moisture and sugar, but low in starch. They are small and round in shape with thin smooth skin that may be red or white in color. These potatoes are well suited to boiling for use in salads,and soups or for making hash browns. Not suited for deep-frying. Mature or Starchy Potatoes are high in starch, but low in moisture and sugar.They are generally light, dry and mealy when cooked. Russet or Idaho potatoes fall under this category and are ideal for baking and making French Fries. Chef or All Purpose potatoes also fall under this category and are best suited for pureeing and mashing. Potatoes are the plump storage roots (tubers) of certain nightshade species of perennial plant. Because some nightshades can be poisonous, the leaves should not be consumed. The tubers vary in size, shape and color, and also depending on when they are harvested. Generally, they are round, bulbous and wither spherical or ovoid. New Potatoes have a smooth waxy skin, while mature potatoes tend to have a rougher skin. There are great differences, however in varieties, the potato is an extremely diverse vegetable, with different and unique cultivars all over the globe. Choosing: Avoid Potatoes with any green visible in the skin or flesh. This means the area was exposed to direct sunlight, and it could have begun producing the nightshade toxin. Selection depends greatly on intended use. For soups and stews, choose small waxy new potatoes if you wish them to remain solid, older larger potatoes will dissolve and thicken the broth. For roasting, broiling and braising, new potatoes are best. For baking and eating whole, boiling and mashing or deep frying mature potatoes are more desirable. Red and purple potatoes add variety and color, and can be used much the same as the russet and white varieties. Buying: Available at all grocers and farmers markets. Procuring: Potatoes are quite easy to grow, however they require more space than most vegetables. Always make sure that every tuber is covered completely with soil. Potatoes are often peeled before cooking, but the skin contains a great deal of the nutritional value. Skin on cooking often is considered 'rustic,' except with red potatoes, where the skin is usually maintained for its desirable color. Cleaning: Potatoes should rinsed and scrubbed thoroughly. Root vegetables are generally more susceptible to contamination from herbicides, pesticides, and water born contagions. Potatoes keep well in cool, slightly humid environments with little or no sunlight. If there is no visible mold, greenness in the skin or flesh, and there are not several 'eyes' growing, potatoes can be kept for months.